This game turned out to be amazing in many respects. A slashing defeat is an uncommon event in Mamedyarov`s practice. Shakhriyar doesn`t lose often at all, but this game was a terrible failure. Of course, nobody is safeguarded against an opening disaster. Even great opening experts can make terrible mistakes. It is possible to remember Kasparov`s famous defeat in his game against Ivan Sokolov in Wijk aan Zee in 1999. But the problem is that Harikrishna chose unpretentious opening indeed. Then Black blundered, didn`t he? Top grandmasters are mere people, and blunders are not alien to them. However, going through the game shows that Mamedyarov didn`t blunder anything. What happened then? Let`s try to get to know together. 1.e4 e5 2.¤f3 ¤c6 3.¤c3!? Harikrishna used this move at the age of 16-17. Now the Indian grandmaster normally seeks an advantage in the Ruy Lopez. 3...¤f6 4.d4. This move is unexpected indeed. Harikrishna has never made it. It comes as no surprise because at the beginning of the previous century one knew that 4...ed 5.¤xd4 Ґb4 6.¤xc6 bc 7.Ґd3 O–O 8.O–O d5 9.ed cd 10.Ґg5 c6 leads to a boring equal game. This estimation hasn`t changed lately. It is interesting that Mamedyarov once played this variation and made a draw quickly. 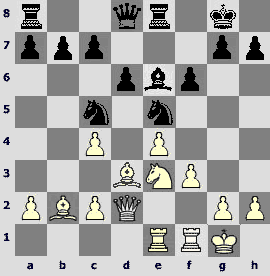 Perhaps, the Indian intended to play the Belgrade Gambit – 5.¤d5!? Maybe he also didn`t object to a draw, did he? However, only Harikrishna himself could answer these questions. 4...Ґb4! ?Mamedyarov fights for the initiative! Now the game seems to be more vivid than after 4...exd4. 5.¤xe5 O–O. Shakhriyar has already tried more popular continuations 5...¤xe4 and 5...Јe7. He decided to choose other way this time. However, this variation is not rare at all. 6.Ґd3!This move looks like to be a rare bird indeed. White usually chooses either 6.Јd3 or 6.¤xc6 in this position. However, the problem is that it is difficult to achieve any advantage after both these moves. So it is quite clear that the Indian wished to use a rarer continuation. I managed to find only six games in which White played 6.Ґd3! However, this move is natural and logical. It is impossible to keep an extra pawn. But now White develops his pieces immediately. Otherwise, Harikrishna`s position could become dangerous. 6...¤xd4 7. O–O d6. It is also interesting to play 7...¦e8! ?, picking on the e4-pawn. 8.¤c4 Ґxc3. It is necessary to destroy this knight because it threatens to jump to d5. Moreover, after 9.Ґg5 the pin is very annoying for Black. Black tried to save his bishop in the game Makropoulou – Hector (Heraclion, 1992): 8...b5 9.¤e3 c6. He managed to rebut both positional threats – ¤d5 and Ґg5. However, simple 10.a4 ba 11.¤xa4 Ґa5 12.c3 provided White with a stable advantage because of better pawn structure. 9.bc ¤e6.Black doesn`t let White`s bishop go on g5. It is time to conclude about the opening. This position seems to be really sharp. White`s queenside is destroyed and the Black`s knight is just about to take an ideal blocking position in front of the isolated c-pawns. On the one hand, White will be doomed to a difficult defense in every kind of endgame. On the other hand, White has strong trumps in the middlegame. Firstly, a powerful bishop that has no opponent on dark squares. Secondly, Harikrishna has a very good and dynamic kingside pawn structure. These pawns can be advanced. These considerations help us to determine the opponents` plans. White has to strive for the attacking Black`s king by pieces and pawns. The c1-bishop is his main attacking piece that will be really powerful on the a1-h8 diagonal. Black has to raise strong barriers on this diagonal in order to minimize the bishop`s influence. It is even better to prevent the appearance of the White`s bishop on that diagonal. Moreover, Mamedyarov must keep an eye on the White`s knight that is always ready to jump either on f5 or on d5. It is also necessary to prevent the advance of White`s pawns. However, the point is that all these aims are absolutely defensive. What must Black do in order to incarnate the advantages of his position? The answer is simple. Mamedyarov has to strive for exchanges because almost all kinds of endgame are favorable for him. The problem is that there is no way of imposing these desired simplifications on White. It is stupid to take on d3, improving the White`s structure. White`s pieces stand so perfectly (especially the e3-knight) that it is quite difficult for Black to play active chess. It means that in spite of the fact that Black stands firmly, White has advantage and initiative. Well, in spite of the Indian grandmaster`s youth, he has already deserved the reputation of a chessplayer of great strategic talent. It seems that he assessed this difficult and non-standard position deeper than his strong opponent. 10...¦e8. The idea of this move consists in the pressure on the e4-pawn so that White wouldn`t be able to advance f2-f4. 11.c4! White opens the diagonal for the main character of this game. 11...¤c5 12.f3 ¤fd7. This continuation looks like to be quite logical. The knight has nothing to do on f6. It isn`t necessary to struggle against e4-pawn because both c5-knight and e8-rook watch it closely. 13.¦b1! White gets ready to bring into action his main power. Hasty 13.Ґb2? would have been a blunder because of 13...¤a4. The rival`s pieces haven`t come into contact yet and the players continue maneuvering. However, one who doesn`t feel increasing exertion will have the taste of grief! 13...¤e5? A first mistake. The knight is not useful on e5. Moreover, it will be under attack after f3-f4. However, althouth it is easy to blame Mamedyarov for this decision, it is quite difficult to suggest an alternative move. The problem is that the knight can`t stay on d7, because the bishop has to take the f5-square under control. Black has an excellent c5-square for a knight but the problem is that there are two knights and one c5-square. Players often say that knights duplicate each other in such situations. Let me suggest a paradoxical decision: 13...¤a4!? Then Black continues 14...¤dc5! 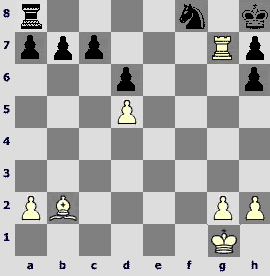 after any White`s sensible move (14.Ґd2, 14.Јd2 or 14.Јe1). Of course, I understand that the a4-knight looks strange. On the one hand, it is far from the kingside – the king seems rather defenseless. On the other hand, Black temporarily solves the problem of the White`s bishop, which now can`t get to the desired diagonal. Moreover, the White`s knight impedes the bishop on the diagonal c1-h6. The problem is that this knight has no way to go. Both f5-square and g4-square are under Black`s bishop control. If White moves ¤d5, Black can always reply c6. At last, it is impossible to advance the f-pawn because of the weakness of its neighbor e-pawn. In general, I didn`t manage to find clear ways of developing White`s initiative. And yet, the problem is that Black still doesn`t have an active plan. He has to content himself with waiting and preventive game because all active continuations (for example, с6, a6, b5) lead to dangerous weakening of his position. To my mind, the arrangement of pieces that was stated above gives Black chance to keep an equal position. 14...f6. Black raises defensive redoubts immediately, but it seems that his defense is helpless. 15.Јd2! White is not in a hurry! It is necessary to mobilize all pieces before a full-scale offensive. 15...Ґe6 16.¦be1!White`s last piece takes an ideal position. Of course, it was early to advance the f-pawn: 16.f4? ¤g4 and Black is ok.
16...Јd7. An attempt to break the cooperation of White`s pieces by 16...¤a4!? 17.Ґa1 ¤b6 doesn`t improve the Black`s position either. It is necessary to defend the c4-pawn. It means that White`s queen has to leave its excellent place. If Pentala prefers 18.Јc3, then Black can continue bothering White`s pieces with 18...¤a4!? 19.Јb4 ¤b6! ?, and the location of the White`s queen seems to be lame. However, White has another opportunity – 18.Јe2! It seems that Black achieved something because the opponent`s queen is situated on the same file as the opposing rook. However, it is unclear how to utilize it. 18...Јd7. Black threatens with 19...Јc6, and White will have to take on e5 in order to save the c4-pawn. This exchange would mean collapse of White`s strategy. So it is impossible to delay 19.f4! After 19...¤xd3? 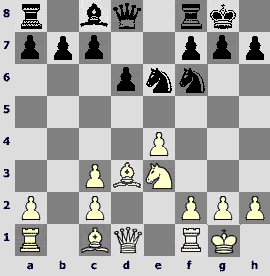 20.cd f5 (on the analogy with the game) poor position of the White`s queen can tell. However, concrete analysis demonstrates that close combat is disadvantageous for Black in this situation either: 21.¦f3! ¦e7 (or 21...fe 22.¦g3 ed 23.Јxd3 ¦e7 24.¦f1!, and White`s menaces are irresistible) 22.¦g3 ¦f8 (22...¦f7? 23.ef Ґxf5 24.¤xf5 Јxf5 25.Јe8!ќ) 23.ef Ґxf5 24.¤xf5!! ¦xe2 25.¤h6 ўh8 26.¦xe2 d5 (there is no better move) 27.¦xg7! Јxg7 28.¤f7!! ўg8 (28...¦xf7 29.¦e8 ¦f8 30.¦xf8#) 29.Ґxg7 ўxg7 30.¤g5, and White seems to win this endgame easily. So Black has to retreat against his own will: 19...¤c6. After 20.¦f3! ўh8 21.¦g3 White keeps strong pressure both in the center and on the kingside. 17.f4 ¤exd3?Black causes the crisis but he is not ready for it himself. However, Mamedyarov is a very aggressive player who doesn`t like passive defense. It is easy to understand that he wanted to impose a counter attack on his opponent, but it turns out to be a worthless attempt in this case. To tell the truth, 17...¤g4? is even worse: 18.f5! ¤xe3 19.¦xe3 Ґf7 20.¦g3!, and Black is defenseless because of a poor location of his bishop: 20...¤xe4 21.Ґxe4 ¦xe4 22.Ґxf6ќ, or 20...ўh8 21.Јh6! (21.¦xg7! also leads to a victory) 21...¦g8 (21...Ґg6 22.Јh4ќ) 22.Јxh7!ќ, or 20...ўf8 21.¦xg7! ўxg7 22.Јg5 ўf8 23.Ґxf6 Ґh5 24.Јh6 ўg8 25.Јxh5ќ. Only 17...¤c6 still allows Black to defense though either 18.¦f3 or 18.¤d5 provides White with stable positional advantage. 18.cd f5?! Black removes barriers from the diagonal a1-h8 on his own and the White`s strong bishop gets the opportunity to attack the opponent`s king over open sights. However, one can say that the Azerbaijanian grandmaster had no choice. Perhaps, Mamedyarov planned to break down the White`s center by 18...b5. Now he has noticed that after 19.f5 Ґf7 20.¤g4! the f7-bishop's location is awful, as it prevents other Black`s pieces from organizing the defense. I don`t see any way of escape. The variation 20...bc 21.¤xf6 gf 22.Ґxf6 loses at once. 20...Јe7 doesn`t help either because after forced 21.¦f3! bc 22.¦g3 ¤d7, a striking 23.Јh6!! leads to a victory. Probably, 20...Ґh5 is the most stubborn move but after 21.¤xf6! gf 22.Ґxf6 h6 (the only move) 23.Јxh6 Јh7 24.Јg5 ўf7 25.Ґd4 ¤d7 26.cb White has not only four pawns for a piece but also a powerful attack. To be honest, it was necessary to play 18...Јe7 repulsing White`s menaces, but after 19.¦f3! (it is stronger than 19.f5 Ґf7 20.¦f3 ¤d7! with the idea of ¤e5) the Black`s position looks hopeless indeed. 19.¦f3! This continuation is simple and strong. The rook settles down to the attack. Probably, one can assess Black`s position as hopeless. 19...¦e7. A forced variation 19...fe 20.¦g3 ¦e7 21.f5! Ґxf5 22.¤d5 Ґg6 23.¤xe7 Јxe7 24.de doesn`t bring any saving chances. 20.¦g3 ¦f7 21.ef Ґxf5 22.¦g5! Ґxd3.More stubborn is 22...h6, though this move doesn`t change the nature of the position. After evident 23.¦xf5 ¦xf5 24.¤xf5 Јxf5 25.¦e7 ¤xd3 (25...Јxd3 26.Јe1!ќ) 26.¦xg7 ўf8 27.Јe3! Black has to choose between a hopeless endgame after 27...¤e5 28.¦xc7 Јb1 29.Јc1 Јxc1 30.Ґxc1, and suffering a decisive attack in the following variation: 27...¦e8 28.¦g8 ўxg8 29.Јxe8 ўh7 30.Јh8 ўg6 31.Јg8 ўh5 32.Јe8 ўg4 (32...Јg6 33.g4ќ) 33.Јe3! There is no satisfactory defense from checkmate threats: 33...ўh5 34.h3!ќ, or 33...¤xb2 34.Јf3 ўh4 35.g3 ўh3 36.g4 ўh4 37.Јg3#, or 33...¤xf4 34.h3 ўh4 35.Јe1! ўg5 36.Јe7 ўh5 37.g4ќ. 23.¤g4. White taps new reserves. 23...Ґg6. Neither 23...¤e4 24.¦xe4 Ґxe4 25.Ґxg7ќ, nor 23...ўf8 24.¤h6! ¤e4 (24...gh 25.Јc3) 25.¦xg7 ¦xg7 26.Јxd3 ¦g6 27.Јxe4 ¦xh6 28.Јd4 ¦g6 29.f5ќcanhelpMamedyarov. 24.f5! Almost all continuations lead to a victory in this position. It is also possible to play 24.Ґxg7! ¤e6 (24...ўxg7 25.Јc3 ўg8 26.¤h6 ўf8 27.Јh8#) 25.Ґb2. Harikrishna prefers to break down the last barrier on the diagonal a1-h8 in a different way. 25...gh 26.Јd4 ¤e6 (the only move) 27.Јh8 ўf7 28.¦xf5 Ґxf5 29.Јf6! It is more accurate than 29.Јxa8. 29...ўg8 30.Јxf5 ¤f8. Or 30...¦e8 31.Јg4 ўf8 32.¦f1 ўe7 33.Јh4. 31.Јd5 Јf7 32.¦e7! Black resigned. What a pity! A vivid position that arises after 32...Јxd5 33.¦g7 ўh8 34.cd, could become a proper finale of the b2-bishop`s performance. The Indian grandmaster played in Smyslov`s best style. Every move is natural and simple, and his overall play makes a very harmonious impression.